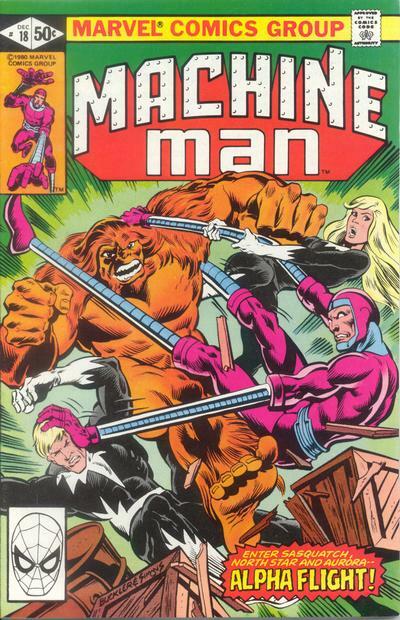 Machine Man is trying to clean up the remnants of Madame Menace’s operation while Senator Brickman is up to his old tricks. Cut to Department H, the Canadian organization that runs their premiere super-team, Alpha Flight. They decide to send the members after Machine Man, thinking him a threat to national security. So not only does X-51 have to deal with Madame Menace, but also Alpha Flight and with a battle on two fronts, not counting the ongoing harassment of Senator Brickman, how does a robot who thinks like a man stay sane? DeFalco and Ditko pose this question to great effect in probably the best issue of the series so far. X-51 rages against those who are against him and against the feelings within himself. The entire issue deals with conflict and does so perfectly and it is wonderful to finally see Aaron Stack, the Machine Man, come into his own even if it is through struggle. With one issue to go until the series end, it begs the question why it had to take so long to get so good, the artwork and the story on the same page.